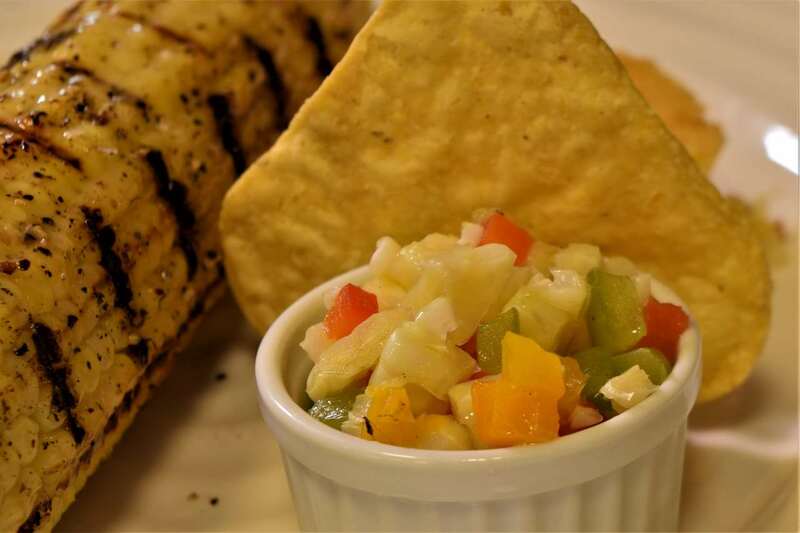 This recipe is controversial in that the kernels of corn are intentionally punctured before processing. 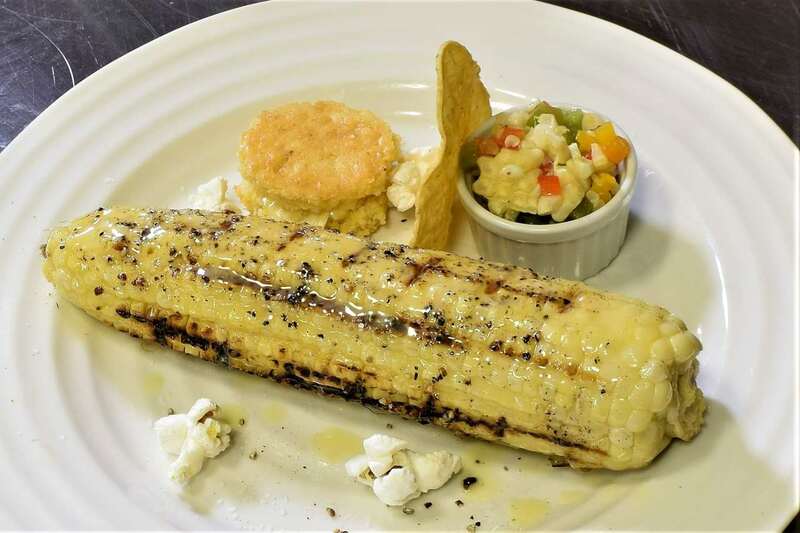 Sweet corn, fresh, 5 ears. Monte au Beurre, one recipe, OR, melted butter, as needed. Popped popcorn, a few pieces. 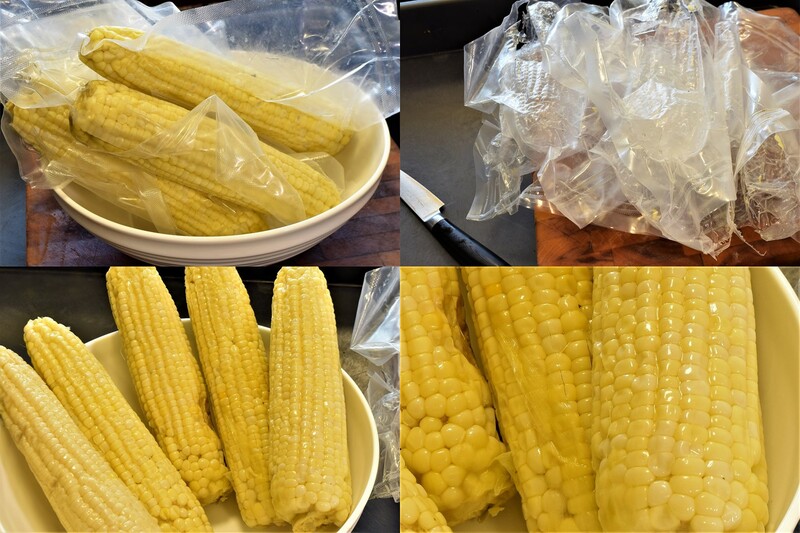 Corn removed from one of the sous vide processed ears. Roasted and peeled peppers, 4 oz/120 g.
Olive oil, a few drops. Lemon juice, a few drops. Baking Powder. 1 Tbsp./15 ml. Evaporated milk (or fresh), 1 cup/240 ml. Use a knife to score the length of the cobs, as shown. A fork can also be used, and it will puncture multiple rows simultaneously, albeit not quite as precisely. Either way works fine! 183 F/84 C for 2 hours. NOTE: This is a shorter interval than the typical 4 hour duration that I utilize. This is because the kernels cook faster when pierced! Remove corn from the bags, and you will see there is no juice remaining. This surprised me the first time I saw it. If you look at the bottom right picture, you can even see the cuts down the middle of the kernels. 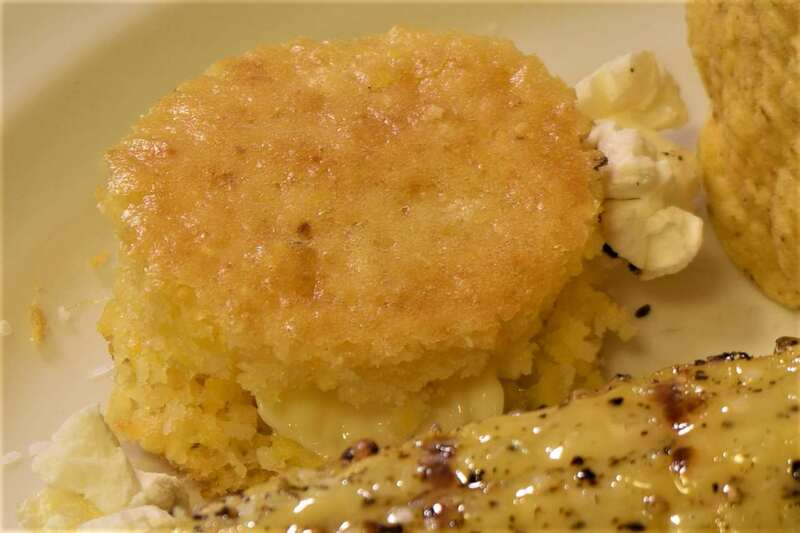 Cut some cornbread into a small circle, proportionate to the other objects on the plate. Split it carefully, there are whole kernels of corn inside. Put a pat of butter inside, and put it back together. There will be lots left over to enjoy after assembly! 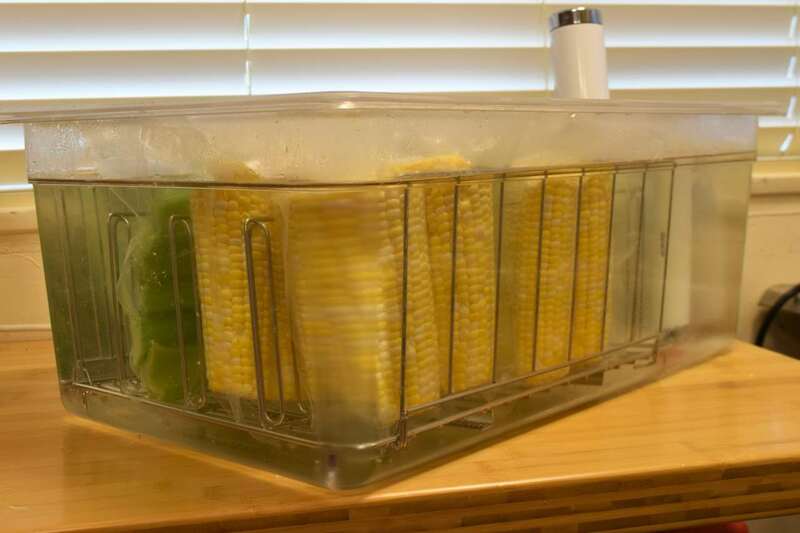 Corn, removed from one of the sous vide processed ears. Roasted and peeled peppers, 4 oz./120g. Combine all ingredients and portion into very small cocottes–size proportion is very important to this dish. I choose this opportunity to straighten up around the kitchen and catch my breath and my wits. We are almost done. Make the Beurre Monte, if you haven’t already. I use a cast iron pan with grates, but any thick bottom pan will work fine. 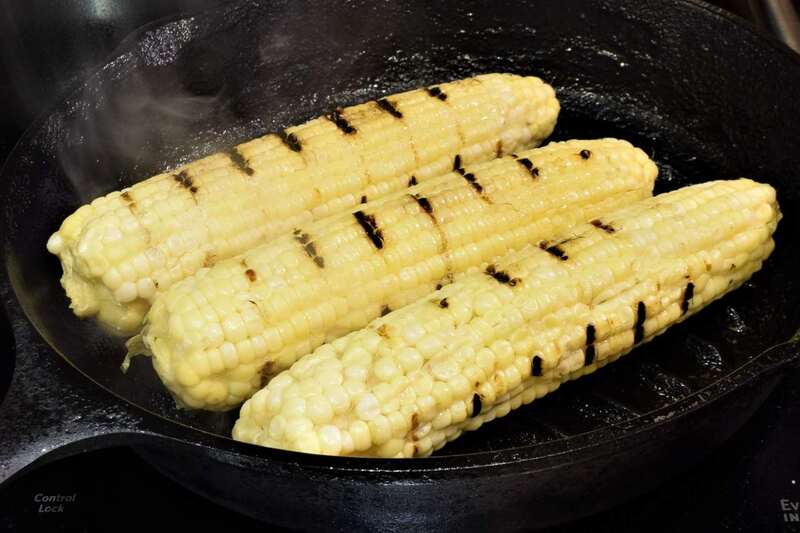 If you want to grill the corn outside, you have my blessing! 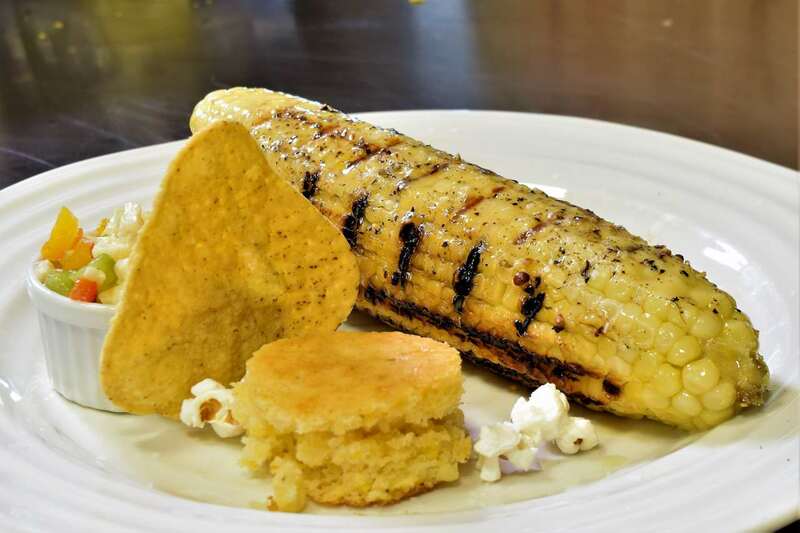 Try to achieve some dark marks on the corn, it will not scorch easily, and the caramelization adds eye and flavor appeal. 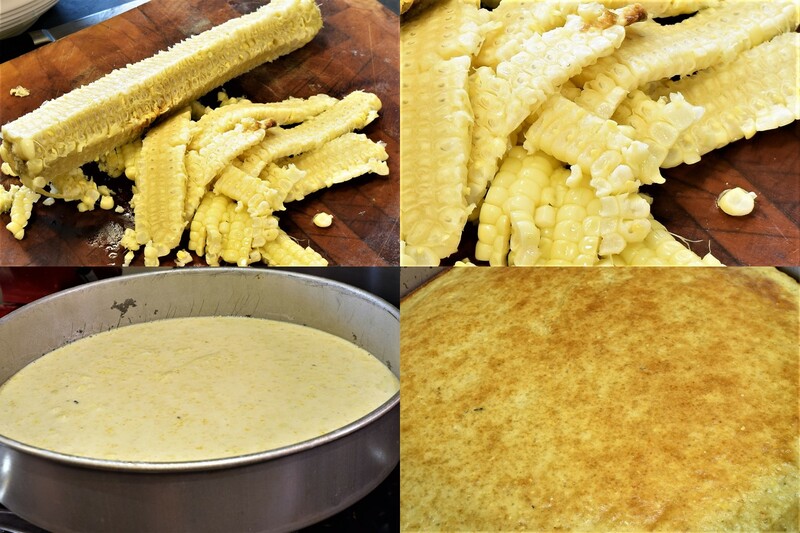 After marking all sides, put the corn cobs in a large bowl and coat with butter sauce. Remove the cobs to the middle of your plates, and arrange the other components around them, including just a few pieces of popcorn. Drizzle a little more butter sauce on the corn and let it spill slightly. Grind black pepper and sprinkle with kosher salt, and there you have it! 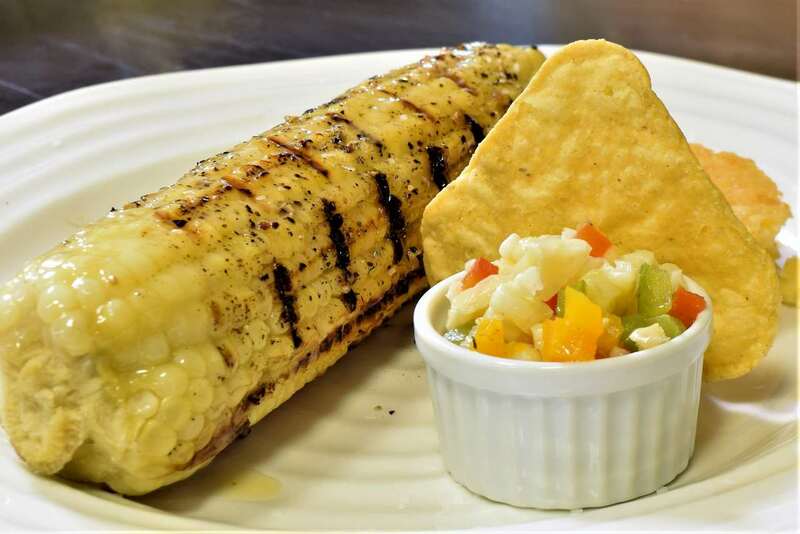 This is more than just some corn! I hope you enjoyed this little demonstration, and urge you to try this method. If it works for you, you will have a terrific tableside story to tell your friends as they enjoy their meal! I saw a presentation a few years ago by a very famous French chef who created a beef marrow dish with corn. The marrow was as you would expect, a moderately tall cylinder in the center of the plate. All around it was corn in various forms--popcorn, corn foam, creamed corn, things with corn that I still don't know the name of. It was whimsical, but very appealing. We're not going to go that far, would that we could, but we will pay tribute to Mr. Robuchon in spirit.